The NHL regular season begins today, and along with it comes the large number of intriguing storylines that happen each and every year. Each NHL season is full of surprises, which is one of the things that makes following the sport so addictive and engaging. But hey, you’re in luck! To get you on the inside track, I’ve compiled a list of 30 predictions, one for each team, that will be worth keeping an eye on in 2014-2015. Try to act at least a little surprised when they all start coming true, OK? Anaheim Ducks: Anaheim’s gamble to go with two young, unproven goaltenders backfires…slightly. The duo of John Gibson and Frederik Andersen play well enough that the Ducks still make noise in the Western Conference, but their goaltending will clearly be the team’s weakest link and prevent them from taking the Pacific Division crown. Arizona Coyotes: The Coyotes didn’t do enough to shore up last season’s 20th ranked goal output (no offense, Sam Gagner), and it only gets worse this year. Oliver Ekman-Larsson continues to grow, but has nobody to finish off his silky passes from the defensive zone. The ‘Yotes finish 25th or worse in terms of goals-for. Boston Bruins: With Johnny Boychuk traded to the New York Islanders, the sky is now the limit for 21 year-old defenseman Dougie Hamilton. The 9th overall pick from 2011 takes the next step in his development and cements his place in Boston’s Top 4, playing north of 20 minutes per game and scoring 35 points. 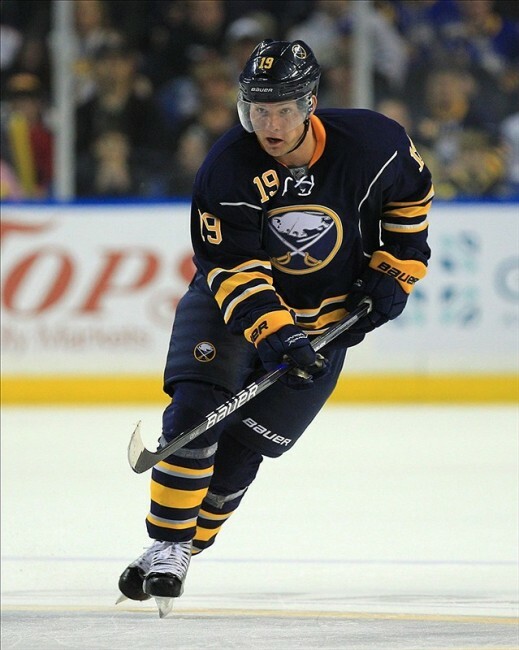 Buffalo Sabres: There won’t be many positives to take out of this season in Buffalo, but the emergence of Cody Hodgson as the team’s de facto best forward will be one of them. The 24 year-old will once again lead the Sabres in scoring, but he’ll improve upon last season’s total of 44 points and finish with 60 or more. Calgary Flames: Many are predicting the Flames to finish in the basement of the Western Conference, but this team will be plucky and full of surprises. The workload will be nicely shared between vets and youngsters, and the goaltending duo of Jonas Hiller and Karri Ramo will be solid. The Flames will still finish near the bottom of the West, but they’ll be a lot better than expected and won’t go down without a fight. Carolina Hurricanes: The regular season hasn’t even started yet and things are already looking grim in Carolina. The team will start the season slow, and not long after is when the Eric Staal trade rumours will start. He won’t get traded this year, but that idea will become quite a common topic of conversation by next summer. Chicago Blackhawks: Corey Crawford has already won a Stanley Cup with the Hawks, but that history won’t be enough to get him out of hot water this year. The 29 year-old will be worse than he was last season and put up middle-of-the-pack numbers for a starting goalie, which will lead to the team adding a veteran backup at the trade deadline to help their playoff push. Colorado Avalanche: What regression? The Avalanche’s huge success last season was largely due to “luck,” in terms of analytics, but they’ll win games differently this year. The young forwards (Nathan MacKinnon, Matt Duchene, and Gabriel Landeskog) will all take the next step in their developments and become puck possession monsters. They’ll make the playoffs again, and do it comfortably. Columbus Blue Jackets: The Ryan Johansen drama might look like it’s over, but it’s only just beginning. The big center will be rusty to start the season after missing all of the preseason and never fully get back to the level that he was playing at last year. Jarmo Kekalainen will get praise for not breaking the bank, but Columbus won’t make the playoffs and plenty of blame will fall on Johansen. Dallas Stars: Tyler Seguin shattered his previous record for points in a season last year, scoring 84, which was good enough for fourth in the NHL. 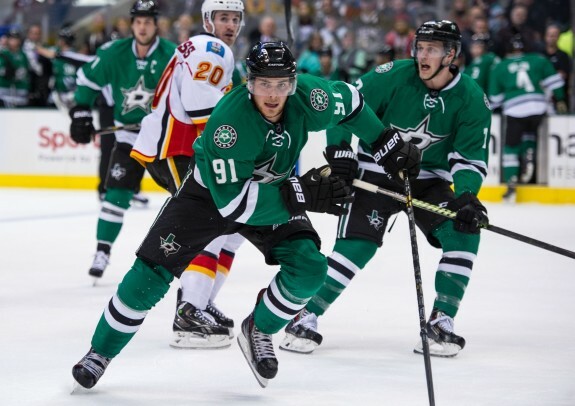 With Jason Spezza now in the mix and able to eat some of the tougher minutes, and with another year of chemistry built up alongside linemate Jamie Benn, Seguin will finish second in the league in scoring, behind only Sidney Crosby. Detroit Red Wings: With another year full of serious injuries, the Detroit Red Wings’ playoff streak will finally snap. Jimmy Howard and Niklas Kronwall will perform admirably and lead by example, and the kids will fill in most of the gaps, but it won’t quite be enough. Mike Babcock will sign a contract extension, though, like he always intended. Edmonton Oilers: Something’s rotten in the city of Edmonton, but nobody can figure out what. Plenty will go wrong, the young team will once again fail to take that next big step, and the Oilers will be out of the playoff race by March or earlier. None of the prized young forwards will get moved during the regular season, but one will finally get shipped out next summer. Florida Panthers: Much like the Calgary Flames, the Florida Panthers will be better than expected this year thanks to a talented group of growing youngsters, a mishmash of serviceable veterans, and two goalies that both perform well. Unlike the Flames, however, the Panthers will be legitimately in a mix for a playoff spot in the weaker Eastern Conference. Los Angeles Kings: Marian Gaborik was an excellent trade deadline pickup for the eventual Stanley Cup-winning Los Angeles Kings last season, and he’s going to look even better this year. The two-time 40-goal scorer will pick up right where he left off in the playoffs, build more chemistry with Anze Kopitar, and score 40 goals once again. Minnesota Wild: It will take half the season, but the Minnesota Wild will finally figure out their number one goaltending dilemma. The winner? Darcy Kuemper. Kuemper will get hot at the right time, seize the job, and never let go of it, helping to lead the Wild to the playoffs. Either Niklas Backstrom or Josh Harding will get shipped out at the trade deadline. Montreal Canadiens: It doesn’t happen very often in the NHL, but a defenseman will lead the Montreal Canadiens in scoring this year, and no, it won’t be Tom Gilbert. P.K. 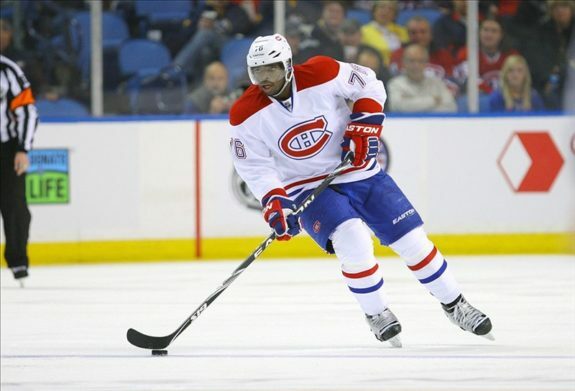 Subban will continue to grow into one of the league’s most exciting players and he’ll put up a ton of points in the process, especially on the powerplay. Nashville Predators: Redemption can be a hell of a motivating factor, as the Nashville Predators will soon find out. Forwards Mike Ribeiro and James Neal both have fresh starts, and both have something to prove to their old teams and to the league at large. The duo will do great things and form the best top line that the Preds have had in years. New Jersey Devils: After being mired in goaltending controversies for most of his career, Cory Schneider will finally be unchained and free to get the bulk share of starts as a bonafide number one goalie. He’ll excel at it, too, and finish the season as one of the three finalists for the Vezina Trophy. New York Islanders: There’s a lot of optimism surrounding the Islanders right now, thanks to a number of big offseason acquisitions. They’ll certainly be better than they were last year, but this team still has a lot of holes, and will find itself uncomfortably in the race for the 8th and final playoff spot in the East. New York Rangers: The Rangers won big on the Kevin Hayes sweepstakes this summer, outdoing a large group of interested suitors to sign the highly-touted NCAA free agent. The honeymoon won’t be so rosy, however, as Hayes will turn out to not quite be NHL-ready, and after a few months get sent down to the AHL for some more seasoning. Ottawa Senators: Goaltending was a weak spot for the Senators last season, as neither Craig Anderson nor Robin Lehner were able to really perform consistently as a number one goalie. The opposite will be the case this year, as both goalies will rebound nicely, creating a wonderful dilemma for head coach Paul MacLean. Philadelphia Flyers: The Flyers will sorely miss the presence of Kimmo Timmonen on the bench and in the locker room, but they won’t miss him as much as they expect on the top powerplay unit. His void will be replaced by Mark Streit and the Flyers will continue to be lethal on the man-advantage, improving their PP rank from 8th to 5th or better. Pittsburgh Penguins: The past will repeat itself this year in Pittsburgh: once again the team has the enviable 1-2 center punch of Sidney Crosby and Evgeni Malkin, but once again the team won’t have any wingers near the same caliber. The two centers will each score over 80 points, but no winger will exceed 60, including Chris Kunitz. San Jose Sharks: There’s been plenty of internal shuffling going on with the Sharks’ roster this summer, which has created plenty of drama, but the main change that will come this season won’t be nearly as controversial. Alex Stalock will play himself into the number one goaltending spot over Antii Niemi, and there’ll hardly be a word against it. St. Louis Blues: Alex Pietrangelo was the best defenseman in St. Louis last season, leading the team in ice time with an average of 25:21 per game. This season he’ll be one of the best defensemen in the entire league…or, he’ll at least get voted that way, becoming a finalist for the Norris Trophy after scoring 50 points and playing a ton of minutes. Tampa Bay Lightning: Don’t look now, but the Tampa Bay Lightning are going to be really, really good this season. Offense? Check. Defense? Nothing fancy, but a deep, balanced group, so check. Goaltending? Check, if Ben Bishop stays healthy. This team will finish first in the Eastern Conference, or at least come very close. Toronto Maple Leafs: A Maple Leafs rookie is going to play himself into Calder Trophy contention this year, and no, it won’t be William Nylander. Brandon Kozun made the team out of camp and will get a great shot at playing on the second line. He’ll fit the bill, and give his team more than 40 points for their trust. Vancouver Canucks: This could be the end for the once-mighty Canucks. The team will be a victim of the brutal Western Conference and, despite some trade deadline pickups, will miss the playoffs by a hair. Veterans will be shipped off next summer and the rebuild will be officially underway. Washington Capitals: There’s been a lot of talk about how much good new head coach Barry Trotz will do for Alex Ovechkin’s game, but the real winner from this new hire? Mike Green. Green will flourish in Trotz’s system, and once again be the number one defenseman that he was earlier in his career. Winnipeg Jets: Evander Kane has gone from looking frustrated by his time in Winnipeg, to looking eerily calm and full of swagger about it. That swagger will be a major concern for opposing teams, as Kane will keep his attention focused on the ice and, combined with his natural talents, explode offensively. He’ll score 30 goals again and lead the Jets in points.